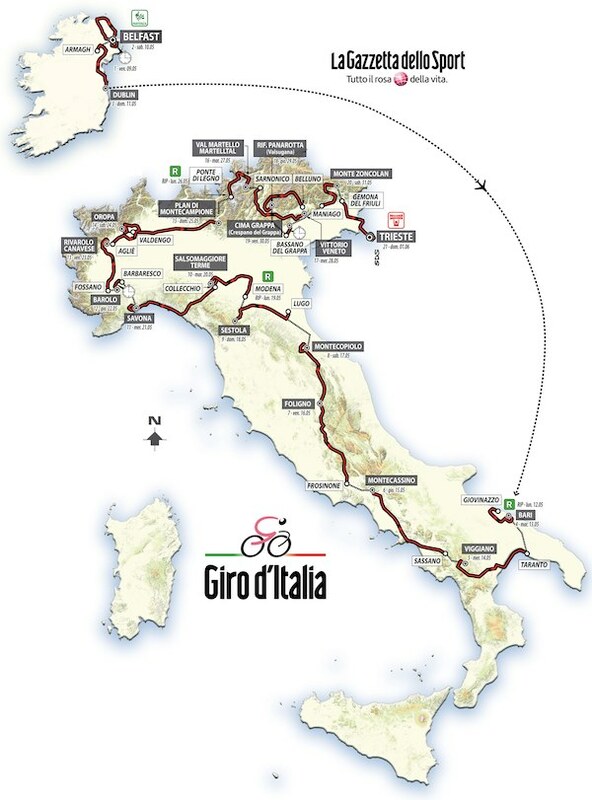 The route of the 2014 Giro d’Italia, from May 9 to June 1, is official. Organiser RCS Sport presented the route this afternoon in Milan’s Palazzo del Ghiaccio. It starts in Belfast, races from the south to north of Italy, includes a 46.4-kilometre time trial in Barolo and climbs the Zoncolan before finishing in Trieste. RCS Sport unveiled the 21 stages, and three rest days, in a sleek, all-white former ice rink – the ice palace. It gets rolling from Northern Ireland with a team time trial. It heats up in the south of Italy and on the mountain passes in the Alps. After the 46.4-kilometre time trial from Barbaresco to Barolo, Piedmont’s wine famous regions, summit finishes dot the menu. In the nine days of racing from Barolo to Trieste, six end on a high note. The weekend before the races finishes, the Giro climbs to Santuario di Oropa (1174m) in Piedmont and Montecampione (1744m) north of Bergamo. It rests the next day – the unusual third of three – and continues to Val Martello (2059m), Panarotta (1780m) and Zoncolan (1730) in Italy’s north east. Zoncolan’s altitude hardly matters when compared to its 22% gradients or average 11.9% over 10.1 kilometres. The climb, which proved popular with the grappa-drinking fans in the past four visits, provides the prefect end 24 hours before the parade into Trieste. In the hammering snow up Tre Cime di Lavaredo this May, Vincenzo Nibali (Astana) maintained his number one spot and Rigoberto Urán (Sky) overthrew Cadel Evans (BMC Racing) for second place. Mark Cavendish (Omega Pharma-Quick Step) finished off the party with a stage win, his fifth in this year’s race, in Brescia the next day. The 2014 route appears to have around eight finishes that could end in bunch gallops. Race director Michele Acquarone was not in the Palazzo del Ghiaccio to explain the stages. As part of an audit into €13m missing funds, he was suspended as a precautionary measure. RCS Mediagroup is trying to get a handle on its sporting subsidiary. After an initial internal audit, CEO Giacomo Catano shifted departments, and Administrative Director Laura Bertinotti and Chairman Flavio Biondi resigned. During the presentation across town in Milan, RCS Sport was able to forget about its problems at least for a few hours and look ahead to 2014.